There are approximately eighty-six distilleries currently operating in Scotland, but nobody fully comprehends why each produces an identifiably unique single-malt product. 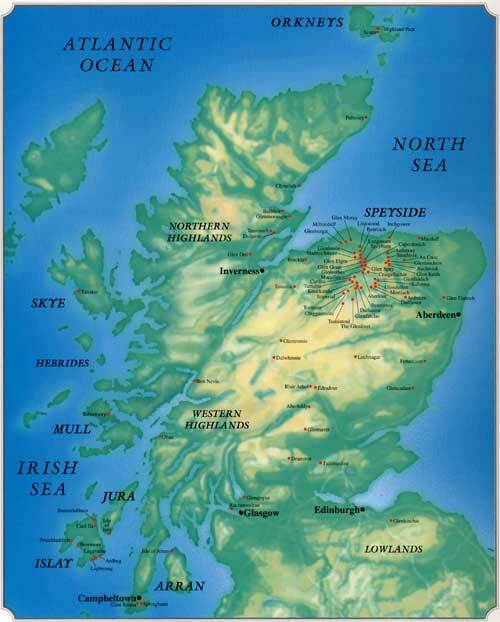 All Scotch whisky is manufactured from barley and the pure water of the Scottish mountains, and the process remains virtually the same at each distillery, yet a Laphroaig from Islay is different from a Bowmore produced on the same island, and very far removed from a Glenlivet from Speyside or a Glengoyne from Dunbarton. The secret of Scotland’s single-malts lies in the Scottish landscape, the great rush of water as it moves from the bens to the glens, and into the tumbling rivers and silent lochs. 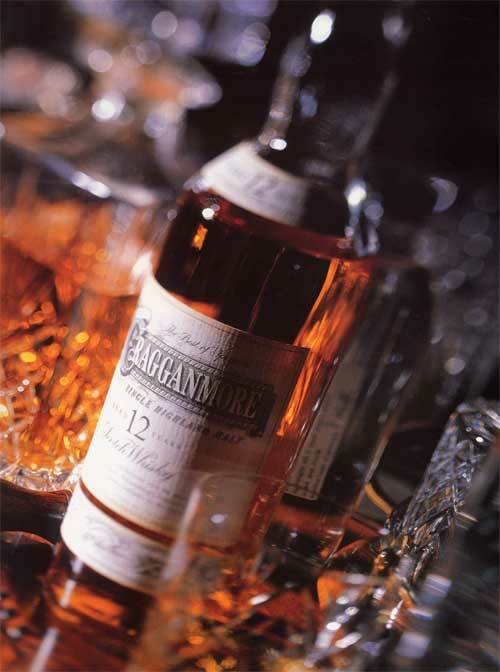 It lies in the aging process, which takes place in oak casks previously containing sherry or bourbon. And it lies in the peat fires of the furnaces, in the shape of the copper pot stills, in the mineral deposits and the plant life through which the water flows on its way to the distillery. All of these things play a significant part in somehow, magically, creating a unique single-malt. Single malt Scotch whiskies have long been appreciated as the perfect after-dinner drink or nightcap, an ideal alternative to brandy, Cointreau, or other liqueurs. 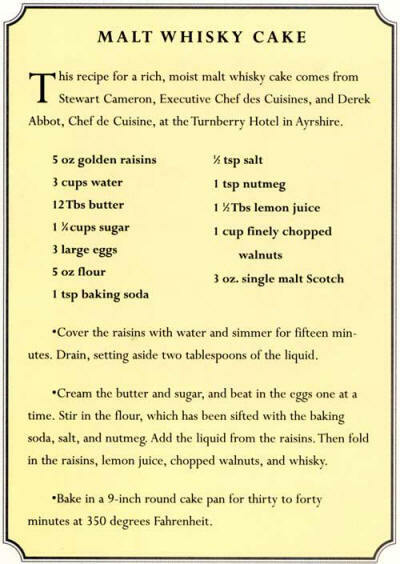 Likewise, it is quite common for Scotch whisky to be taken as an aperitif, though in this case a blended whisky, possibly in a cocktail, is more appropriate than a single-malt, whose relatively intense flavor should not be allowed to dull the palate before one is seated at the dinner table. Scotch whisky is far less often appreciated as an accompaniment to food, and yet it really should not be overlooked as a delightful and intriguing alternative to wine. Clearly, the company must exercise a certain degree of moderation, as it is by no means difficult, over the course of a long, multicourse dinner, to become excessively intoxicated. But if consumption is kept to a reasonable level, and if care is taken in matching specific dishes with appropriate whiskies, then a sumptuous dinner party may also be an opportunity for friends to embark together upon a magical tour of Scotland, using single-malts as their guide. A light Glenkinchie or Glengoyne, for example, makes a fine companion for a starter dish. A nicely balanced Auchentoshan, or almost any Speyside malt, goes well with meat and game, while a vegetarian main course will go very nicely with a warm and malty product of the Eastern Highlands such as Fettercairn or Edradour. A Glenmorangie, Royal Lochnagar, or Cardhu complements a rich dessert delightfully, and an assertive Island malt such as Talisker or Lagavulin is a superb companion for a plate of cheese. While it may strike some as a radical idea to serve Scotch whisky with food, one should never be too quick to rule out any of the myriad ways in which uisgebeatha may be enjoyed. Thankfully, the image of the typical Scotch drinker as a tweedy old gent with a ruddy complexion has largely disappeared. Scotch whisky in all its varieties is now seen as the drink for the contemporary man and woman, a drink that reflects confidence, success, and sophistication. The mystery of Scotch keeps it from being common, and the passion and loyalty of its drinkers raises it to a level above the ordinary. It is truly a remarkable creation.